Can laughter bring you closer to God? 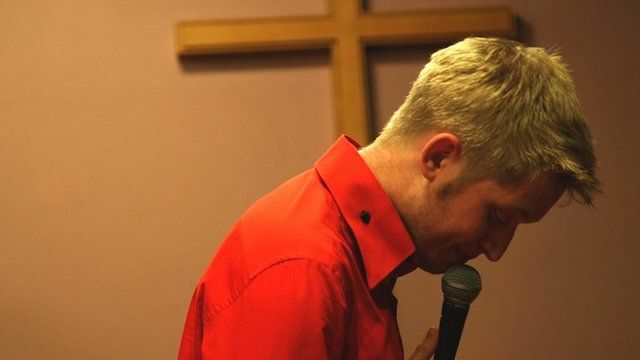 Jump to media player BBC News follows Christian stand-up comic and entertainer Tom Elliott, as he performs a typical gig at a church on a Friday night. The serious work of comedy Jump to media player For the likes of Michael McIntyre, Russell Brand and Micky Flanagan a stand-up tour can be lucrative affair, but at the other end of the spectrum there are many hard gigging comedians struggling to make a living. 'I don't think Scunthorpe has a future' Jump to media player Scunthorpe's Tata steel works are proposing 900 job cuts, casting a shadow over the town that has depended on the industry for 150 years. The blind birdman of Brazil Jump to media player Juan Pablo Culasso has been blind since birth but he has become one of the best "birdwatchers" in South America. Can laughter bring you closer to God? Tom Elliott tours the UK as a comedian, magician and all-round entertainer. But the majority of his gigs aren't in comedy clubs or theatres - they are in churches, of all denominations. He is a regular on what is known as the 'Christian circuit'. A committed Christian, he hopes his brand of comedy can bring people closer to God. But can the spirit of comedy and evangelism really mix? BBC News went on the road with him, on a typical Friday night gig at a Methodist church in south London, to learn more about what motivates him.